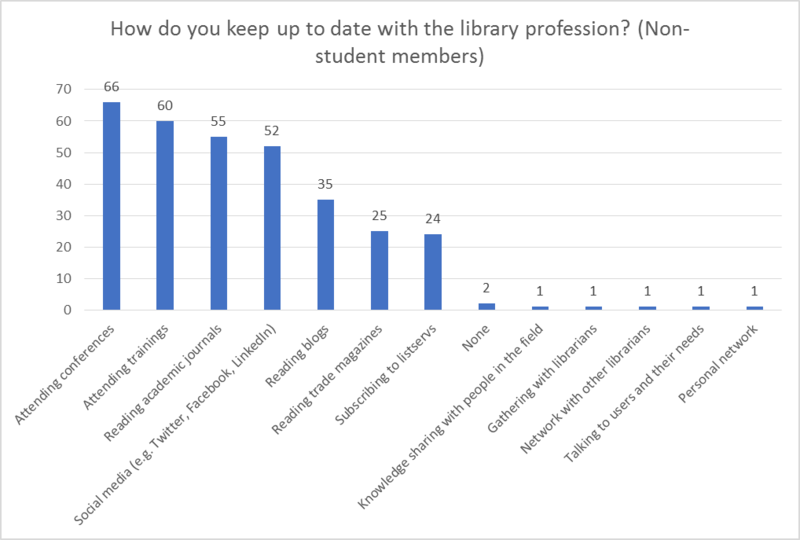 The HKLA council conducted a survey in May 2017 in order to learn more about library professionals and library students in Hong Kong- both members and non-members. The survey gathered 188 responses. Based on our findings, the survey task group proposes the following four action areas for HKLA. The overall results and findings of the survey follow. Members overwhelmingly joined HKLA in order to support the profession and to receive updated information about the profession. It is clear that our members take pride in their profession and HKLA membership is an important part of their identity. Our outreach should be tailored to the library profession: professional talks, newsletter articles, and social media posts should celebrate the library profession. 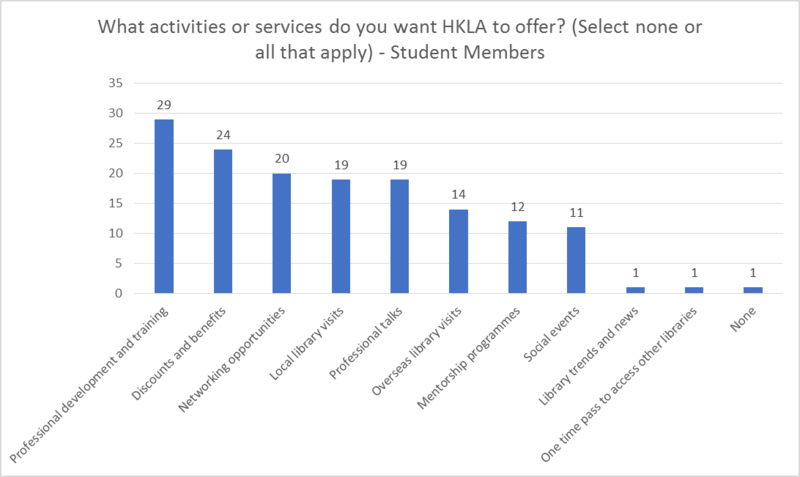 When asked what activities or services they would like HKLA to offer, student members were more interested in networking opportunities, and non-student members were more interested in professional talks. As both activities are highly desired by all respondents, perhaps these activities can be combined. Professional talks could incorporate an aspect of networking in the form of a post-talk reception. Second only to attending trainings, respondents overwhelmingly turn to social media to keep up to date with the profession. HKLA should continue to explore its use of social media and can use Facebook to share the latest research and developments with library professionals. Respondents have a strong interest in library technology and library trends. HKLA should focus its talks and trainings programmes on new developments in the industry. 188 people responded to our survey: a majority of them (70%) are members, while there was good representation from non-members (30%). Respondents, both members and non-members, come from all library sectors. HKLA members from academic libraries make up the largest sector (35% of respondents). Of the 133 members who responded to our survey, 47% are Full Members and 31% are Student Members. Other than HKLA, 11 respondents are also members of CILIP and 9 respondents are members of ALIA. While individual respondents mentioned memberships in local professional bodies and special interest associations like church groups or Hong Kong Libraries Connect, the majority do not have any other local memberships. HKLA has a great opportunity to connect with members in a Hong Kong context as the primary organization through which members can meet and network locally. Members overwhelmingly joined HKLA in order to support the library profession and to receive updated information about the profession. However, respondents’ outlooks are far from traditional. 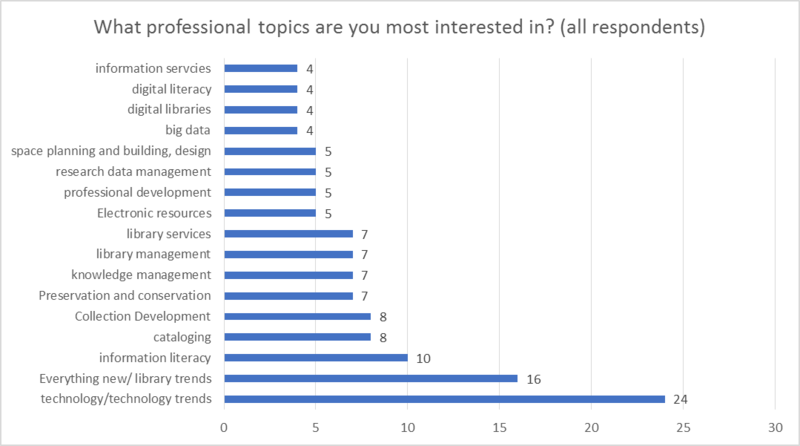 When asked in an open-ended question what professional topics they are interested in, respondents offered a myriad of subjects. While traditional topics like cataloguing and collection development are mentioned, current topics like information literacy and big data are also of interest. Overwhelmingly respondents were interested in keeping up to date with technology trends. 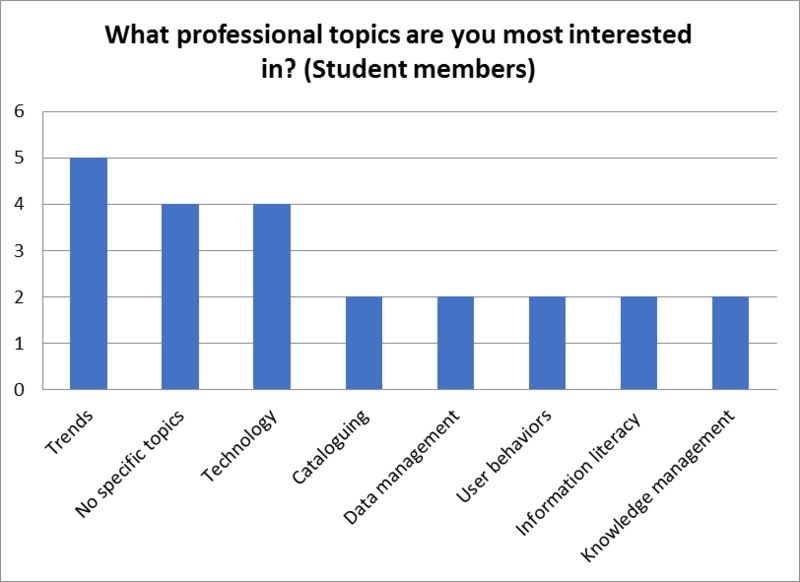 While both student and non-student members were most interested in technology and trends, non-student members had more diverse topics of professional interest. All members are interested in trends and technology, suggesting that our talks, newsletter, and social media content should focus on those areas. 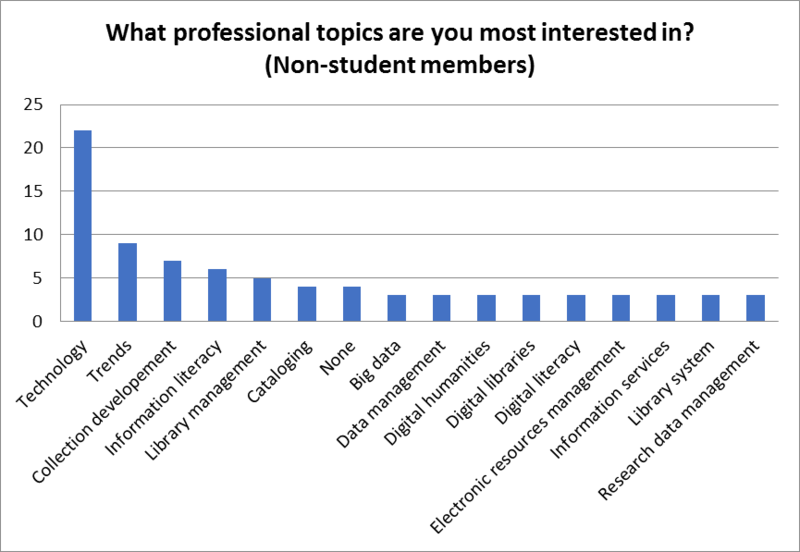 Student members may have less exposure to diverse professional topics, which gives us an opportunity to provide a service by highlighting library trends. Similarly, respondents use a variety of methods to keep up to date with the library profession. The primary method, used by 119 respondents is trainings (whether provided by their employers or undertaken elsewhere). Respondents are also very proactive, using social media, academic journals, and conferences to keep up to date almost as much as they use formal training. Overall this suggests that our members and potential members are open-minded and engaged with the library profession. They care about traditional library issues, but also explore current trends through social media, academic journals, and conferences. Student HKLA members and other HKLA members (including full members, honorary fellows, etc) keep up to date with the library profession in fairly different ways. 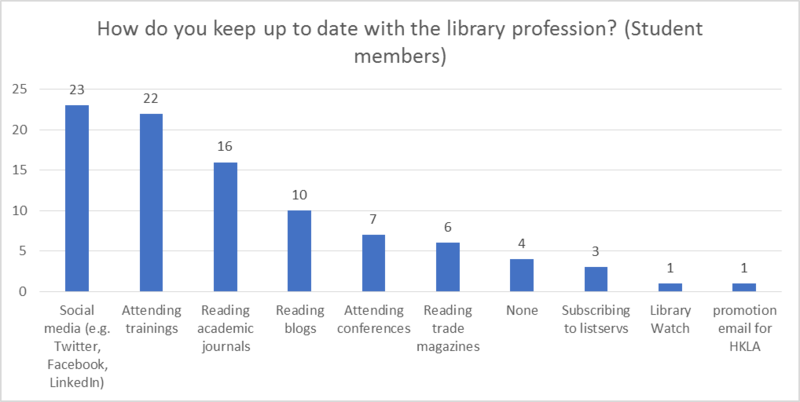 While both groups used trainings and academic journals to learn about the latest developments in the library profession, student members rely much more on social media than do other members. Other members (including full members) rely much more on library conferences. Full members and other professional members likely receive support from their employers to attend conferences, while student members may not have such an opportunity. Respondents expressed their preferences through their survey responses. For example, most prefer to receive updates from us via email or our website. A smaller proportion prefer Facebook and WhatsApp. This suggests that traditional communication methods still serve their purpose for our members and target members. The new HKLA website and updated council member email system need to be leveraged for good communication with our members. 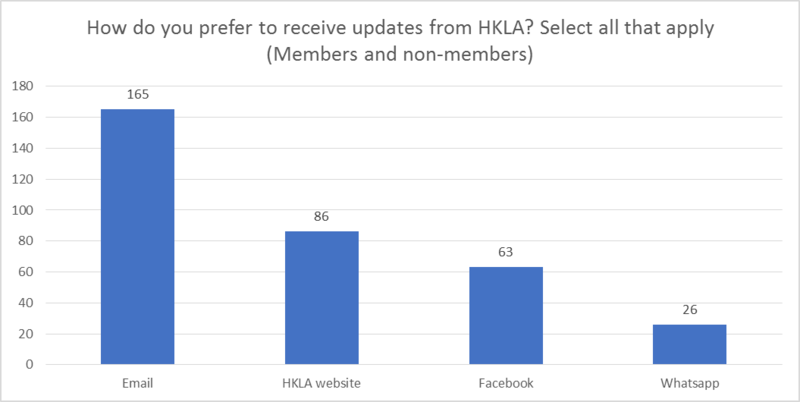 Respondents also indicated which existing HKLA activities are most useful to them, with the pattern looking similar for members and non-members. Both members and non-members find job advertisements and professional talks the most useful. This suggests that respondents primarily see HKLA as a means to support their career development. Members found conferences/ seminars and local library visits to be 3rd and 4th most useful, whereas non-members found local library visits and overseas library visits to be 3rd and 4th most useful. Around 42% of both members and non-members found the newsletter to be useful to them. It seems that some of HKLA’s core activities are proving to be useful to both members and non-members. Interestingly, the two groups (members and non-members) find similar activities to be of most use. Respondents provided valuable feedback in the free-form comments section. We received 6 comments suggesting that we organise more social and networking events. We received a further 6 comments urging HKLA to strengthen ties with regional library organisations and to build our presence. In terms of activities and services, respondents indicated that they want HKLA to continue offering programmes like professional development & training and professional talks. Interestingly, there was almost as much interest in discounts & benefits and networking opportunities as there were in professional talks and local library visits. While some professional associations offer discounts and benefits including bookstore discounts, trade magazine subscriptions, or discounted conference fees, HKLA has not explored these in recent years. 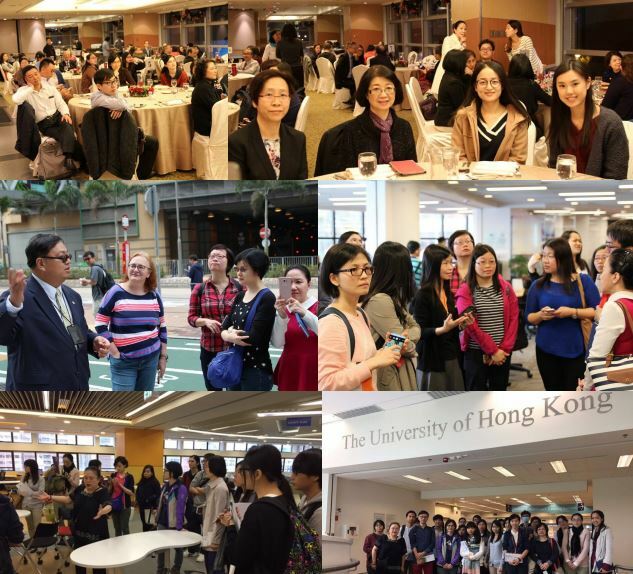 Likewise, some professional associations offer networking opportunities like informal events or outings, but HKLA has tended to focus on library visits and professional talks. Professional development & training, discounts and benefits, and networking opportunities are within the top four most desired activities by both student members and non-student members. Professional talks are slightly more in demand for non-student members, whereas student members desire networking opportunities more. Perhaps non-student members, more established in their careers, are more interested in professional talks, whereas student members who are embarking on their library careers are more interested in networking opportunities. The HKLA Survey provided us with valuable information on the needs and interests of HKLA’s members and potential members. These findings will shape HKLA’s projects, activities, and communications to better fit the interests of library professionals in Hong Kong.